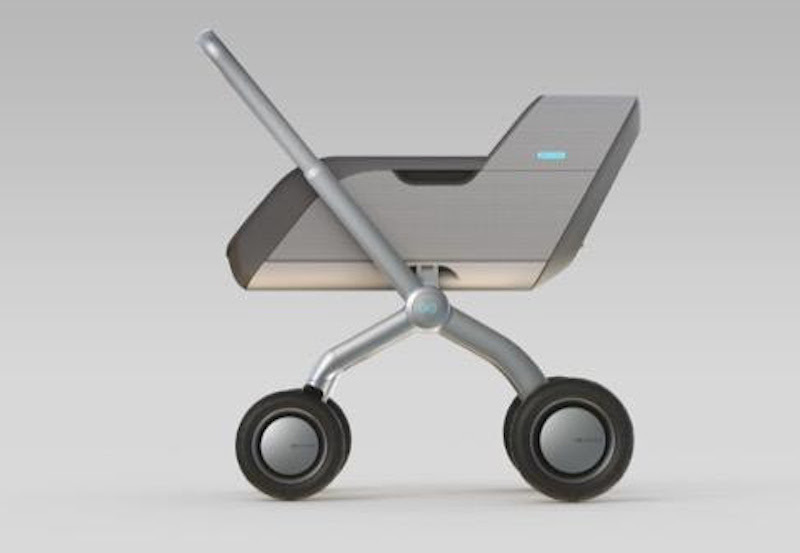 It was only a matter of time before the tech world gave birth to a smart stroller. Unlike this prototype by Volkswagen that stemmed from Facebook suggestions for the German automaker, the Smartbe is already on Indiegogo. This innovative stroller, which features a self-propelled mode, electronic climatized control system, an electric bottle warmer, wireless speakers, and more than one webcam and microphone, is yet another device that thrives on our society’s digital obsessions — but we have to admit that several of its components are pretty highly covetable. And did we mention it can actually charge your phone while you’re out and about? Read on to see the Smartbe in action. The most buzzworthy feature of the stroller is its self-propelled mode, which uses a battery-operated electric engine and a motion-activated sensor to push the stroller a safe distance in front of you. For anyone who has ever tried to run up a hill (or manage farmer’s market loot) while pushing a sleeping toddler knows how awesome it would be to have the use of your hands. The assist propelled mode incorporates sensors for keeping parents within a safe distance while they maintain contact with the stroller and also adjusts the weight load so that they can push the stroller easily even with one hand. There’s also a manual option that requires no battery. The safety nerd in us also loves the sleek light signals that provide an extra security measure for night walks. And did we mention that only authorized users (parents, grandparents, babysitters, and nannies) can enable the wheels to unlock? Of course, all of the stroller’s data and technology, including anti-theft security features, video monitoring, and an emergency stop button, is transmitted and controlled via a smartphone app, so you can always keep tabs on your precious cargo and your precious stroller too. But don’t think this stroller is all about Mom and Dad’s comfort. The built-in rocker, retractable canopies that shield baby from light and insects, adjustable positions, and a climate and temperature controlled bassinet that also includes air filters against pollution and allergens are all features that will keep baby as cozy as can be. Being a Smartbe baby sounds pretty good. And looks good too — the company is offering several different customization options including a rugged camouflage print, a flamboyant zebra print, and a sleek monochromatic option. Of course, all these fancy shmancy features come with a comparable price tag: the most souped up version will cost you $3,199. If it’s any consolation, however, Smartbe promises that every stroller can go from a single to a double at no additional cost. It was only a matter of time before the tech world gave birth to a smart stroller. Unlike this prototype by Volkswagen that stemmed from Facebook�suggestions for the German automaker, the Smartbe is already on Indiegogo. This innovative stroller, which features a self-propelled mode, electronic climatized control system, an electric bottle warmer, wireless speakers, and more than one webcam and microphone, is yet another device that thrives on our society's digital obsessions -- but we have to admit that several of its components are pretty highly covetable. And did we mention it can actually charge your phone while you're out and about? Read on to see the Smartbe in action.